Original Tractor Cab is one of the leading aftermarket cab, canopy and sunshade manufacturers. All products are made in the USA and carry a one-year warranty. 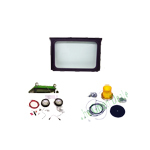 GreenPartStore is proud to carry Original Tractor Cab enclosures and accessories for your John Deere or Kubota vehicle. Cab enclosures let you stay out of the wind and weather and also greatly improve your safety by protecting you from debris. 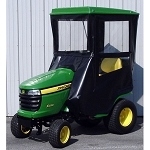 We carry cabs for a wide variety of John Deere and Kubota models as well as tons of accessories from Original Tractor Cab. Accessories include cab additions like safety light kits, windshield wiper upgrades, and safety glass window upgrades, as well as cargo box covers. If you have any questions about our selection, please feel free to contact us at GreenPartStore. For installation or technical questions regarding Original Tractor Cab products, please call 800-247-5305.